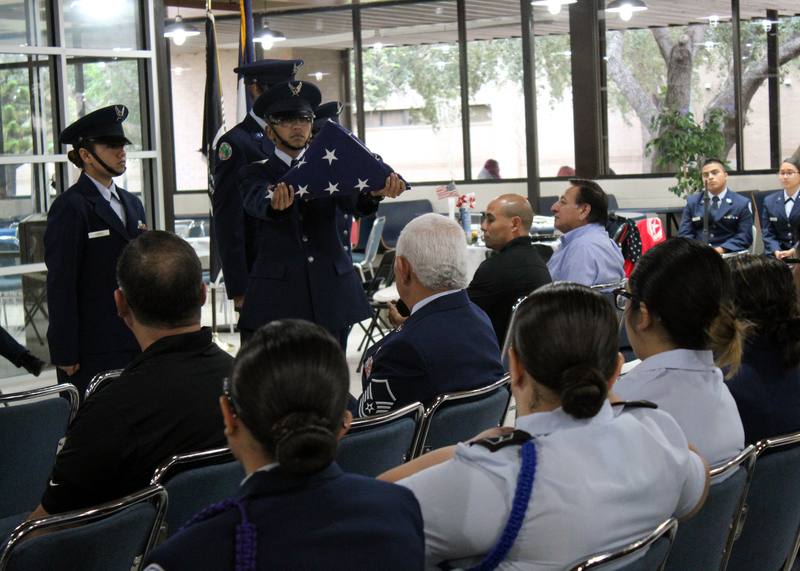 (HARLINGEN) – The Veterans Center at Texas State Technical College hosted its annual Veterans Day Celebration in honor of employee and student veterans who have served in the U.S. Armed Forces. But this year, TSTC and the Veterans Center also posthumously honored U.S. military veteran Troy Davis, a TSTC Biology graduate and former Veterans Center work-study program employee who passed away only a few weeks ago. Davis earned his associate degree in Spring 2018 and was working on completing his academic core. In his work-study position at the Veterans Center, he made it his mission to help those transitioning into civilian life and back into college. To continue Davis’ legacy and honor his military service, Guevara announced during the ceremony that the veteran scholarship created by the Veteran Students Alliance Club in 2013 will now be called the Troy E. Davis Memorial Scholarship. The funds for the scholarship are raised annually by the club and awarded to three student veterans. The individual scholarships are valued at $300. TSTC serves 500 veterans statewide and 139 in Harlingen, in addition to the number of veterans who work at TSTC. One of those veterans is Erica Gonzalez, a student recruitment coordinator at the college, who shared her story during the ceremony. Gonzalez was a migrant worker and an avid athlete when September 11, 2001, set her path. After attending one semester at the University of Texas-Pan American on a full athletic scholarship, Gonzalez enlisted. She served four years in the Army under the Military Police Corps, stationed in Germany. The program also included remarks from master of ceremonies and TSTC Computer Networking and Security Technology student Johnny Rivera, the presentation and retiring of colors by Harlingen High School South JROTC, a Prisoner of War and Missing in Action presentation by the American Legion 15th District Drill team, and recognitions by TSTC veterans program officer Jose Villegas. TSTC in Harlingen has been recognized as a Military-Friendly School for eight straight years, and the college has been recognized statewide as a Military-Friendly School for three years. The TSTC Veterans Center serves as a centralized, one-stop shop for prospective and current students who are veterans, as well as their dependents. The center assists with admission, financial aid, GI Bill and Hazlewood applications. There is also a variety of services, such as internal and external referrals, that veteran students can benefit from. In addition to the Veterans Center, TSTC also offers competency-based learning for veterans who have gained applicable skills through their service in the military. For more information on the Veterans Center, call 956-364-4387 or visit tstc.edu/veterans.